Journey with us to a Forbidden Planet, Loremasters. Today we visit the Planet of Sorcery! Join us as we venture deep into one of the most forbidden planets in the galaxy. Past Altair IV to the Planet of the Sorcerers. Home to the Thousand Sons and numerous Daemons of Tzeentch–including the beastment who have started to rise above their bestial nature, the Tzaangors–the Planet of the Sorcerers has long been a last refuge of the Thousand Sons, who fled there after their trouncing by the Sons of Russ when they laid siege to Prospero. 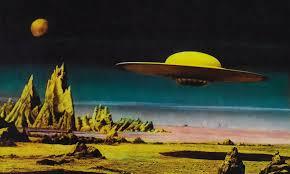 Ironic, really, since that now desolate world is also where the mysterious Planet of the Sorcerers resides. A great mock to the Wolves, for reality has been torn asunder to help locate this world in the Materium. But let us talk of that in a moment. For now, here is what is known of this strange and heretical world. 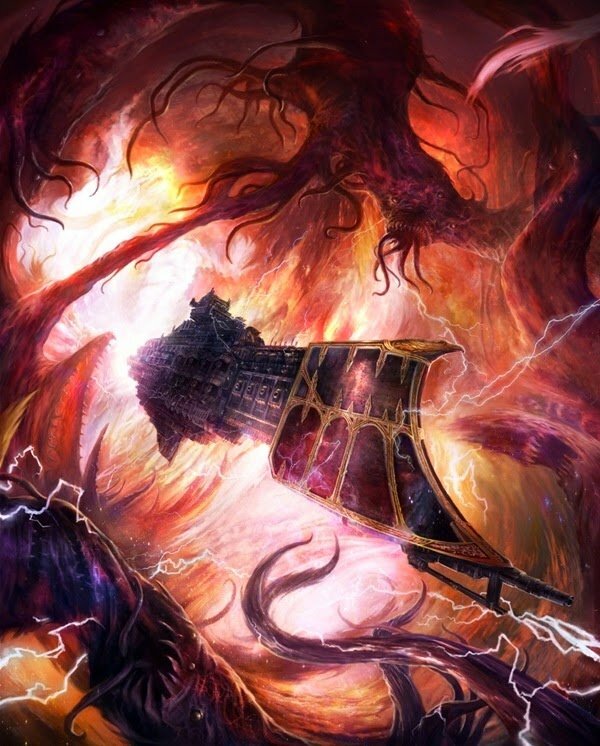 Sortiarius, the Planet of the Sorcerers, is a Daemon World and the current homeworld of the Thousand Sons Chaos Space Marine Legion. At the conclusion of the Battle of Prospero, Magnus the Red used his sorcerous powers for a last-ditch master spell, transporting the surviving warriors of his Legion through the warp to another planet, one promised to them as sanctuary. This planet is now the Daemon World of Magnus the Red; dark, rocky, volcanic and in constant turmoil. Its skies are storms of warp energy; low-hanging multi-coloured clouds cover the land and rain drops of energy to fill up the unnaturally dark rivers and seas. 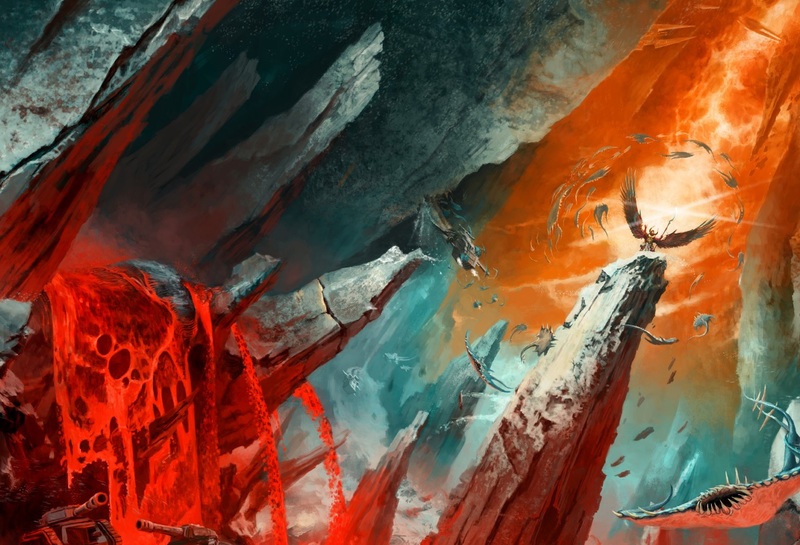 The Sorcerer’s Towers of the Thousand Sons thrust up from rocks jutting from lava plains, twisted mockeries of what the City of Light once was. Dwarfing all other towers is Magnus’s own, an obsidian monolith called the Tower of the Cyclops. As well as being staffed by thousands of servants and troops, Magnus’s tower also possesses a sorcerous, great, glowing eye. The Eye of the Tower watches over the planet, its gaze also penetrating through the warp into the material galaxy. 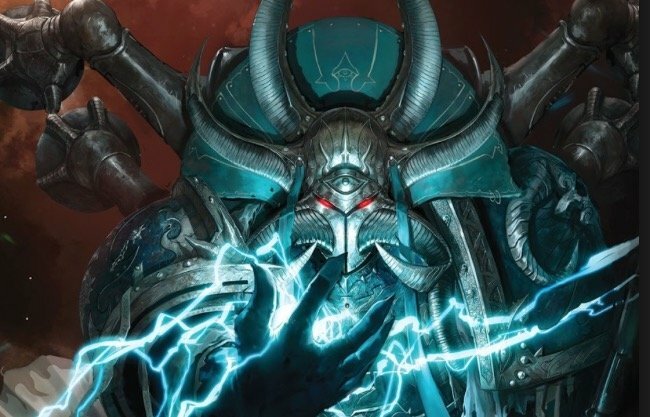 This allows Magnus to sense the arcane artefacts and gifted psykers which fascinate him, so that he can despatch his Thousand Sons to raid the Imperium. When the Thousand Sons first arrived on the planet, they found it unpopulated. Over thousands of years of raiding, they have acquired a multitude of minions. This has created a servant underclass, some of which have escaped their masters into the hostile land. These escaped servants then often join the nominally independent nomadic warbands upon the Planet of the Sorcerers, warbands led by both Championsfrom the Thousand Sons or powerful mortals risen from the ranks of the escaped servants. Often, these mortal champions arising among the warbands are then recruited back to serve the Thousand Sons. Individuals with psychic powers are much sought after for the Thousand Sons to act as servants, becoming known as Thrall Wizards, psykers bound to the service of particular Sorcerers. Also notable is the amount of Beastmen arisen upon the planet, a subordinate population group that developed over thousands of years. While some of these mutants – specifically referred to as Tzaangors – enter various warbands, most remain wild. Little is said of flora or fauna, apart from the presence of Chaos Hounds amongst some warbands. But this once-hidden world has since come crashing violently into the Imperium of Man. 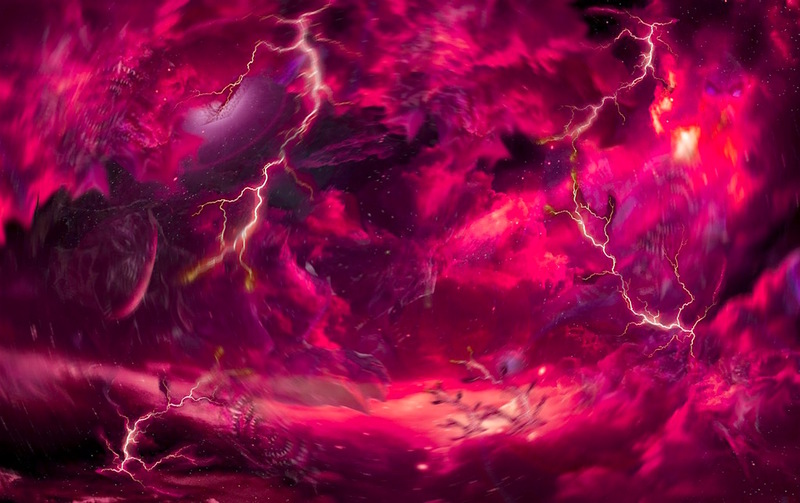 Fueled by the heretical powers of Magnus the Red, now a Daemon Primarch, the Thousand Sons capitalized on a series of Warp Storms that plagued the Imperium near the end of M41. Chaos had invaded the entirety of the Fenris System. Every world and planet in the system save Fenris itself was under assault. On Frostheim, Alpha Legion Chaos Lord Vykus Skayleled the assault alongside Daemons flowing onto its surface from a Warp Rift. The Alpha Legion was successful in summoning a vast storm of Daemonic Rifts across the system at the decree of Abaddon himself. Striking simultaneously at both Midgardia and Fenris, the Thousand Sons invaded the home world of their greatest foes, and over three days stretched the Imperial forces to the point of breaking. By day 3 of the invasion, each Silver Tower was the site of an arcane ritual being conducted by the Thousand Sons Sorcerers. Their 9 hour, 9 minute, and 9 second ritual was conducted over a captive Space Wolf sacrifice. Combined together, the ritual managed to summon Magnus the Red himself to the realm of Fenris. With him came Ahriman and those other commanders who had been banished from Magnus’ side following the casting of the Rubric including Nezchad Aratos, Aarthrat, and Omarhotec. Ahriman and Magnus had temporarily reconciled over the shared prize of bringing doom to Fenris. Quickly after Magnus’ arrival Fenris erupted into a living hell. Volcanic activity erupted, glaciers shifted, and warp phenomena transformed the landscape into a portrait of madness. The Thousand Sons Silver Towers targeted each nexus of power on Fenris, shattering it and slowly tearing the world apart. After several days only one nexus remained: The Fang itself. Though the brave warriors of the Space Wolves would ultimately buy enough time for the Grey Knights to banish Magnus and his Sons and their Daemonic Allies back to teh Warp–the daage had been done. In the aftermath of the war, Fenris was saved but devastated and few Imperial defenders were left. Frostheim had been reduced to a wasteland of bone, its icy mantle melted away to reveal a thick stratum of fossils. There were those who said that under the new moon some of these skeletons came alive, hunting for the blood of those mortals still eking their lives from the osseous wastes. Svellgard, the ocean moon, was evacuated over the course of a long and difficult month. As it passed close to the Wolf’s Eye, it was subjected to a barrage from solar storms induced by Midgardia’s demise. Solar flares lashed its surface, turning the once-tainted seas to steam. Though barren, it was subsequently resettled, its sandy islands turned to mountains of glass amidst the hard-baked crust of the seabed. Valdrmani, the Wolf Moon, remained a hellish wasteland. It had been the site of a Daemon ritual of surpassing size, and though it had since been reconsecrated there were sightings of Warp-gheists for weeks. The moon was wracked by electrical storms and hurricanes of flesh-stripping intensity, but it rode out the catastrophe, rebuilt by the Adepts of the Imperium into an astropathic relay station. As was the case with the First War for Armageddon the Ordo Hereticus and Grey Knights purged the Human survivors of the campaign, for they had witnessed a Daemon Primarch itself. With reluctant approval, Grimnar doomed the tribal warriors of Fenris to liquidation. And as the Grey Knights heroically executed any innocent survivors and continued proving all around that the Imperium is no stranger to villainy of any kind–the Thousand Sons and their Daemon Primarch celebrated. For theirs was a victory. With a howl of triumph, Magnus revealed that his plan had succeeded and the Sortiarius was transported by a ritual fueled from Midgardia’s sacrifice. It reappeared over desolate Prospero, bringing with it a great Warp Rift and hordes of Daemons. The Imperium would never be the same. The Galaxy is burning with sorcerous flames–what hope do we have of dousing them?